It has been snowing now for several days. 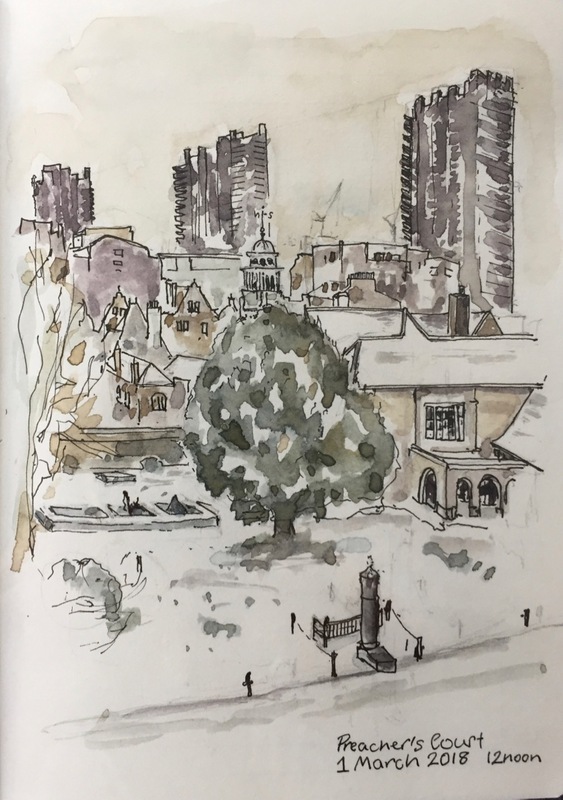 Robin invited me to sketch The Charterhouse in the snow, and suggested a viewpoint from the second floor of the Infirmary. From here I could see all three of the Barbican Towers. Someone was clearing snow in the foreground, but they moved on before I could get them in the picture. It was a good place to sketch, warm and quiet. I could hear the muffled sounds of the nurses moving about below, and of the Brothers who were in the infirmary. Sometimes they called out. Here is what the picture looked like before the colour went on. This picture took about 2 hours: One hour for the pencil outline, half an hour for the pen, and half an hour for the colour – roughly. It took ages to get the proportions right. Especially in the snow, the eye sees detail in far-away objects, so the temptation is to draw them too big. 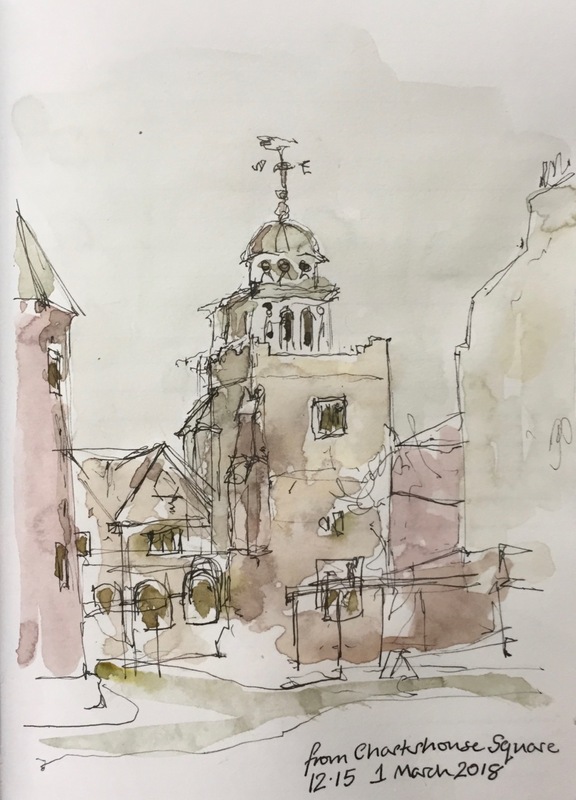 After I handed in my visitor’s badge at the gate, I went out into Charterhouse Square. I looked back at the Chapel. And did a quick pen sketch, standing in the snow. This took about 10 minutes, coloured later on my desk at home. Thank you to Robin, and to the Brothers, Master and staff at the Charterhouse for their hospitality. I am really enjoying your work. It is so fresh and natural. It reminds me a bit of the sketches by Ptolemy Dean, who was one of the presenters of the programme ‘Resoration’ which was on tv some years ago. I have his book and it is great. I look forward to seeing more of your sketches. Do see if you can find a copy. Nathaniel.